[SADX & SA2B] First evolution and gradual evolution. Re: [SADX & SA2B] First evolution and gradual evolution. Correct. I meant that you must have given it animals or Chaos Drives from the green group, to make it lean towards the run type. Stats have absolutely no effect on evolution, so you should never assume that your chao will evolve into the type for which it has the highest stat. It will evolve according to the interaction it has had with animals or Chaos Drives. It doesn't need to be recent interaction, either. You could have given the chao ten animals or Chaos Drives from the green group immediately after it hatched. If you then never give it anything from the red group to balance that out, it could well evolve into a run type chao, even if you don't give it any more green animals for a long time. This seems to confuse a lot of people, so I put together a little tool which demonstrates how evolution works. The tool starts you off with a chao with all E grades, and you can give it different animals or Chaos Drives. While giving those to the chao, you can observe the effects they have on both its stats and its gradual evolution sliders. It shows that stats have absolutely nothing to do with evolution, except for how first evolution increases a stat grade. This tool is available online on my website. You will need the Microsoft Silverlight 4 plugin installed in order to view it; it's similar to Flash. This is just a small and fast download, and you will be given a link to it on the page if you don't already have it. If you find any bugs in my tool, then let me know. Ok that tool is awesome, but how do the Gold and Black animals work? I believe the gold, black, and blue animals all choose a random stat type to make the chao lean towards. 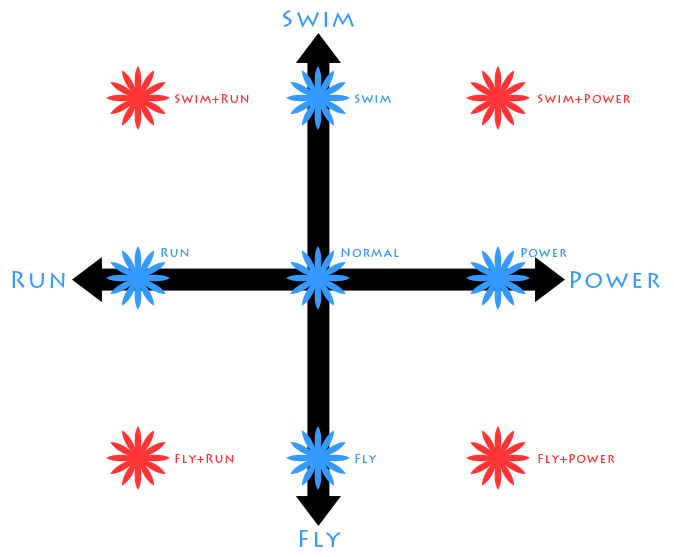 It could begin to lean towards the Swim type, the Fly type, the Run type, or the Power type. This is reflected in my evolution demonstrator tool. Is that what you were asking about? I remember reading about the possibility of advanced evolutions in a SA (DC) faq on gamefaqs a while back, but didn't really believe it. And they should definitely be added to the main site. Edit: The faq was talking about a third (and fourth) evolution, not what Fusion's talking about. They are different. Just wanted to clarify that before someone else did. Fusion wrote: ..... This is reflected in my evolution demonstrator tool. Is that what you were asking about? Coool. Where would you put it up? YT? Or Here? Chocolatethestarchao wrote: Coool. Where would you put it up? YT? Or Here? I'll be happy to see it once you do. This appears to work the same way in Sonic Adventure 2 (Dreamcast). I gave a baby chao 10 red drives, and (despite not turning very red as a baby) it evolved into a power chao. After 20 purple drives, it began slowly turning into a Power/Flying chao. Pretty crazy stuff - I always used to give my chao hundreds of animals and drives to get the second evolution. Turns out all I really needed was some patience! But yeah, this system seems to be identical on the Dreamcast. I'll do some further testing though. I've tried to make my chao n/s a n/s/r, but it hasn't changed much other than turning slightly aqua. ABout how long do I need to wait for it tot become a full nb/s/r chao in the GC? Re: [SADX & SA2B] Evolution requirements. Fusion wrote: To make this easier to understand and visualise, I created a simple diagram which is hopefully easy to understand. The blue stars are the single second evolutions and the red stars are the combined second evolutions. Remember that these marked points are the extremes; that is, the maximums. You can theoretically pick any point within those limits and obtain that exact unique second evolution. So, is the second evolution really a blend of up to 3 forms? Correct me if I'm misunderstanding anything here. The blue stars on that chart are the pure forms, while the red stars are 50/50 blends of two of those forms. Do other points result in other blend ratios (such as 20% Run, 80% Fly)? Are points not at the outer edge of the chart blended with the none/normal shape? If so, given that each drive or animal moves a slider by 1/40th of its length, wouldn't there technically be... 40x40=1600 (slightly) different "second evolutions" for each first evolution? Last edited by Tayrtahn on Fri Jun 10, 2011 4:28 am, edited 1 time in total. Tayrtahn wrote: So, is the second evolution really a blend of up to 3 forms? Tayrtahn wrote: Correct me if I'm misunderstanding anything here. The blue stars on that chart are the pure forms, while the red stars are 50/50 blends of two of those forms. Do other points result in other blend ratios (such as 20% Run, 80% Fly)? Are points not at the outer edge of the chart blended with the none/normal shape? Yes, I believe everything you said is correct. Any point not drawn on my diagram will be a blend between three of those forms, including the normal form. Tayrtahn wrote: If so, given that each drive or animal moves a slider by 1/40th of its length, wouldn't there technically be... 40x40=160 (slightly) different "second evolutions" for each first evolution? There are 41 different second evolution values for each slider: 20 values above 0, 20 values below 0, and 0 (the neutral position). This means there are 41x41=1681 different second evolution combinations for each first evolution. For a child chao's gradual evolution, there would be 21x21=441 different combinations (without counting alignment). So a second evolution chao is different from another second evolution chao of the same type? like a N/S/R chao isn't the same as another N/S/R chao? As stated in my previous post, each first evolution has 1,681 different second evolution combinations. If you take two different chao that have the same first evolution, they may or may not have identical second evolutions. You can't say for sure that they'll be different. However, this is all ignoring the magnitude or strength of the second evolution, which increases as the chao grows up. As chao age, their second evolution transformation becomes increasingly more pronounced and visible. If you factor this in as well, then the different possibilities increase significantly. Alright then. THanks for clarifying that up for me. So it'll be a while before I see my N/S/R chao fully become an N/S/R, then, and it'll look a bit differnt from the N/S/R chao picture on the site. This explanation actually brings quite a bit of order to the chaos of chao evolution. One question though: How does chao/player interaction in SA2/B affect the hero-dark scale? I've heard (but not confirmed) that it takes 25 "steps" to move a chao's alignment from neutral to pure good or pure evil. I believe the actual number is either 20 and 25. In any case, a chao will move one step on the alignment slider each time the ball over its head changes into a heart. Petting a chao is a pretty surefire way to do that, but a chao that likes a character enough may also display the heart when picked up. Feeding also works. Note that there is no real benefit (at least in terms of alignment) to holding down the button when petting a chao. You'll make much faster progress if you pet the chao, wait for a second, and pet it again. For whatever reason, this can be done more rapidly if the chao is sitting down. Once you get the hang of it, it's fun to rapidly pet a chao and watch it change color and shape as its alignment shifts. Tayrtahn wrote: I've heard (but not confirmed) that it takes 25 "steps" to move a chao's alignment from neutral to pure good or pure evil. I believe the actual number is either 20 and 25. The alignment value changes in steps of 0.05, unless you're using alignment fruit. This means it takes 20 steps to move from neutral to pure hero or pure dark. How much does it change when you use an alignment fruit? The last bite of a Dark Fruit subtracts 0.15 from the Alignment slider. The last bite of a Hero Fruit adds 0.15 to the Alignment slider. It takes four last bites (or complete fruit for simplicity) of a Hero Fruit or Dark Fruit to make a fully neutral chao set to evolve into a certain alignment. It takes seven last bites (or complete fruit for simplicity) of a Hero Fruit or Dark Fruit to make a fully neutral chao fully lean towards a certain alignment.